How do you include plantain pith/vazhaithandu/plantain stem in your food? Stir fry/Juice/Curry? I love it as pickle or in dosa. A very simple but power packed nutritious which is my all time favourite is the plantain pith dosa. My Perimma introduced this to me and it is an unique variant in dosa. I had sent this as a guest post to Mrs.Gouthami Yuvarajan’ s food blog Clicks n Bites. Occasionally we met in the blogging world and I just love her clicks. Both of us are budding bloggers and young mothers. Her recipes are definitely unique and will tempt you to try for sure. Looking out for a great blogging journey with her and I wish her all the very best in all her endeavors. Thanks again Gouthami. Let us have a look at the recipe in detail here. 2.Clean and finely chop vazhaithandu. 3.Grind the rice and dhal by adding less water. 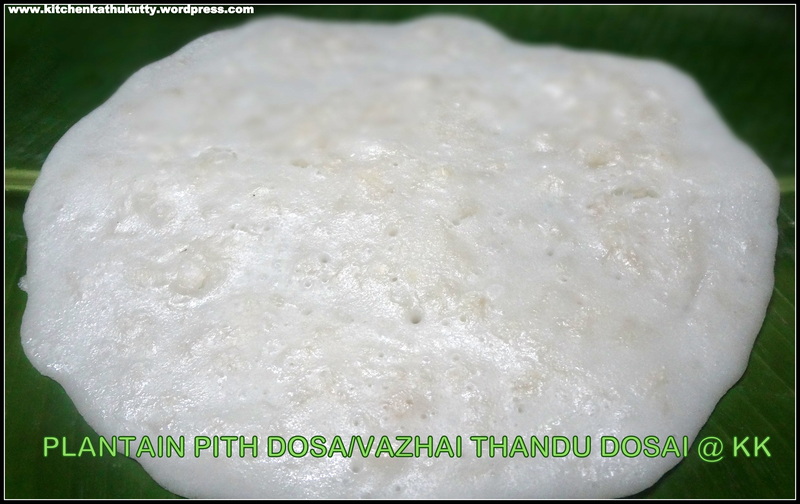 4.Add salt to batter and chopped vazhaithandu/plantain pith. 5.Mix well and add water to the batter to reach thick pouring consistency. 6.Grease the dosa pan with oil and spread the batter. 7.Close with a lid and cook in medium flame. 8.Flip side and cook the other side. 9.Repeat the same for rest of the batter. 10.Serve it hot with spicy tomato chutney. The batter should be neither thick nor in free flowing stage. So add water carefully. The plantain stem has to be chopped very finely. You can add chopped onion,green chilly,curry leaves and coriander leaves ,if you feel the dosa might be too bland in taste. Add chopped pieces to butter milk+water mixture as it prevents darkening due to oxidation. Vazhaithandu is a good medicine for urinary infections. The quantity of plantain stem is upto you. It is diuertic. Hence avoid excess consumption. Always have a word with your doctor before introducing new foods to babies. Banana stem is a rich source of fibre . It also helps ease constipation. Banana stem is rich in potassium and vitamin B6 just like the fruit. Vitamin B6 helps in production of haemoglobin and insulin. Again, it improves the ability of the body to fight infection. Potassium helps in the proper functioning of muscles, including the cardiac muscles. It also helps prevent high blood pressure, and maintain fluid balance within the body. Purdue University says that the peel, stem and roots of the Musa plant are used to treat digestion problems such as diarrhea, stomach lesions and dysentery. This is one of the recipes from my mother in law. She is an interesting cook with 1000’s of recipes and variants. I am in love in with her cooking. You cant say no to any of her dishes,be it simple or super special. I eat little extra if she cooks.My husband introduced me this dish actually. Add oil in a kadai and fry chopped shallots and green chilly/red chilly until it turns golden brown. Let it cool. In a mixing bowl add salt,ragi flour,chopped keerai and fried chilly+shallots. Add water little by little and mix the flour. The dough has to be kneaded smooth and soft like chappathi dough. The consistency should be perfect enough to be spread with hands . Take a plastic sheet/banana leaf ,grease with oil and spread the dough with your palm. For babies omit the drumstick leaves. This is a heavy dish . So prefer it for breakfast. Add water carefully little by little. 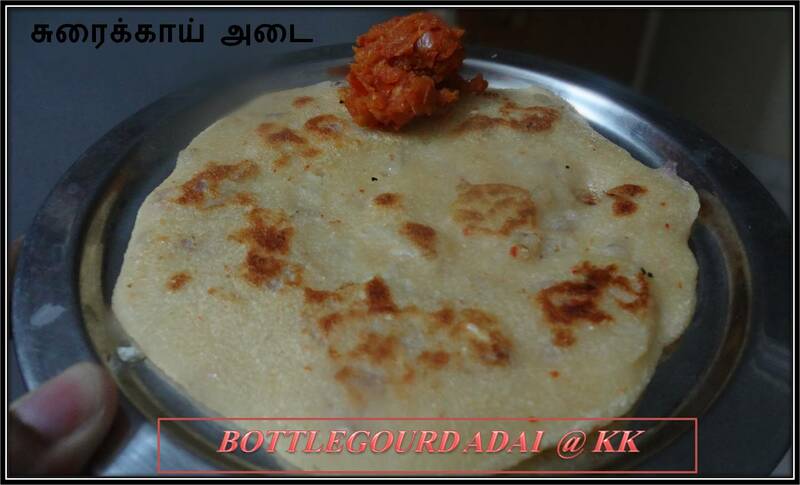 To make consecutive adai’s grease a plastic sheet with oil and spread on it and then transfer to tava. Cook it in slow flame by sprinkling oil on first side. This recipe is a variant of a traditional recipe of my family. Initially this recipe was opposed by my family as they felt it was adulteration to tradition.Later they fell for it on tasting it.My father in law keeps mentioning this recipe his family and friends as he relished it so much. 1.Soak rice,red chillies and dhal for 3 hours. 2.Grind rice,dhal,red chillies and bottle gourd into a semi coarse paste. It should be thicker than dosa batter. 3.Add salt and chopped onion. 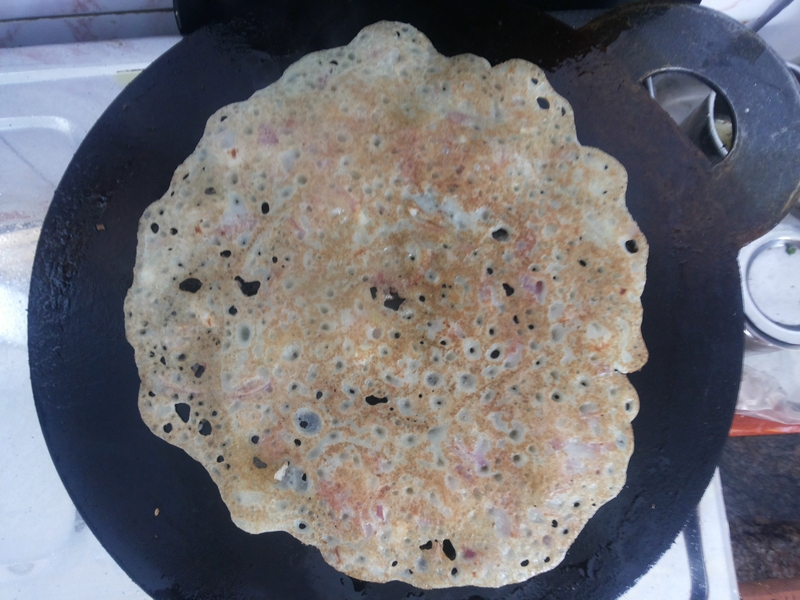 4.Grease a dosa tava and spread the batter evenly . 5.Sprinkle oil immediately after spreading batter. Like Varutha paruppu(Fried Dhal) adai ,this also goes well with onion green chilly chutney and tomato onion chutney. Coconut chutney is a universal combo. While grinding be careful with water level,as bottle gourd also contains water. If the batter becomes so watery the dosa will break while flipping. If the batter becomes runny ,adjust by adding rice flour. You can also dry roast rice and dhal before soaking like Varutha paruppu(Fried Dhal) adai recipe. 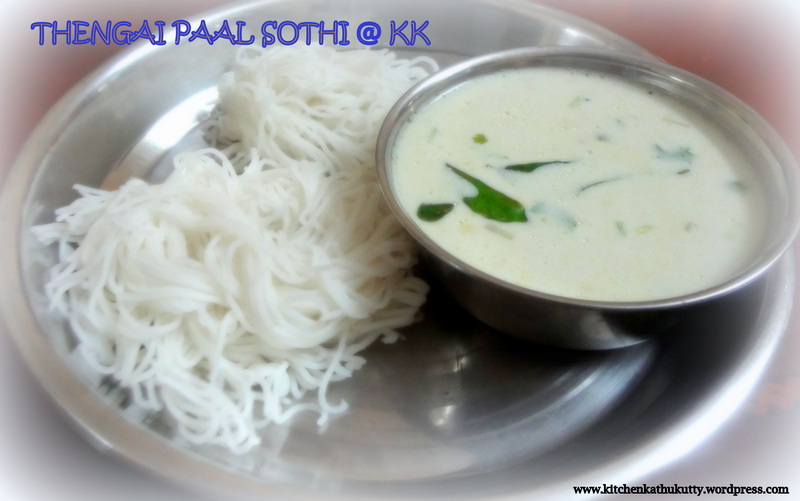 This kolakari also known as khicidi amidst our family is a perfect combination to idly/dosa. 1.Steam cook/boil the tomatoes and blanch them. 2.Mash the tomatoes well and keep it aside. 3.Heat oil in kadai and temper with mustard seeds,urad dhal and curry leaves. 4.Add hing and turmeric powder. 5.Add chopped onion and chilly and saute well until onion turns translucent. 7.Now add the mashed tomatoes pulp. 8.When the mixture starts boiling,add salt and mix it well. 9.Switch off the gas and serve the curry with idly. P.S: The consistency should be like idly sambhar.Stop cooking accordingly. You can also use a mixer to make tomato pulp. 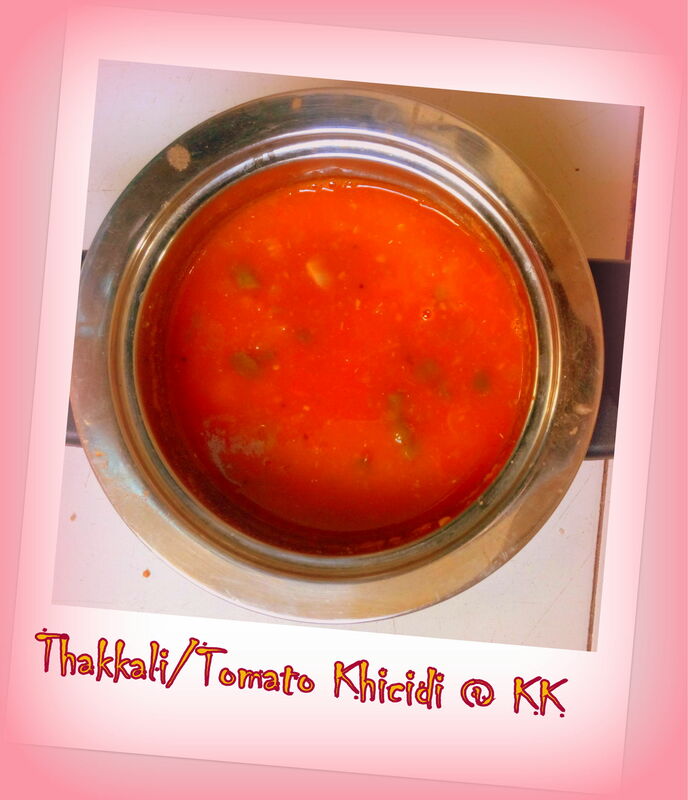 Choose tangy country side tomato to have the best kolakari. The below recipe is so unique from our family and it renders a yummy dish. 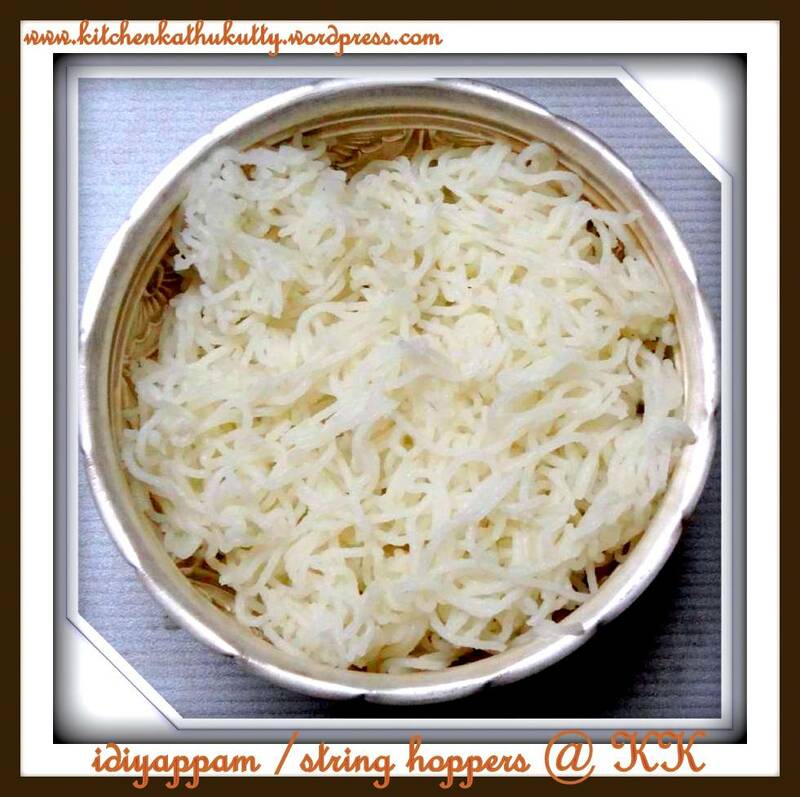 All of you might think what is there with Idiyappam recipe. Kindly go through the below one and try it once. It is off course a tough procedure. But once you are used to it,you ll never leave this out. A very perfect baby food for 8 months plus. Check out this steaming hot and the most yummy Idiyappam making 🙂 Do check out my instant idiyappam recipe and millet idiyappam recipe. 1.Wash and soak rice for 3 hours. 2.Add rice,salt and grated coconut in a blender and grind it very smooth by adding water. 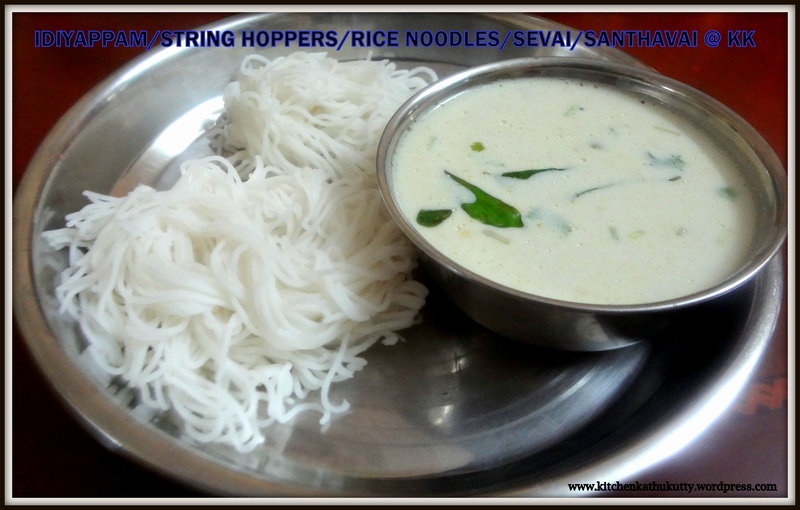 3.It has to be in dosa batter(pouring) consistency. 4.In a kadai add oil and once its heated,pour the batter and start stirring immediately. 5.Keep stirring until you reach the below format i.e. you should be able to make non sticky and soft balls out of it. 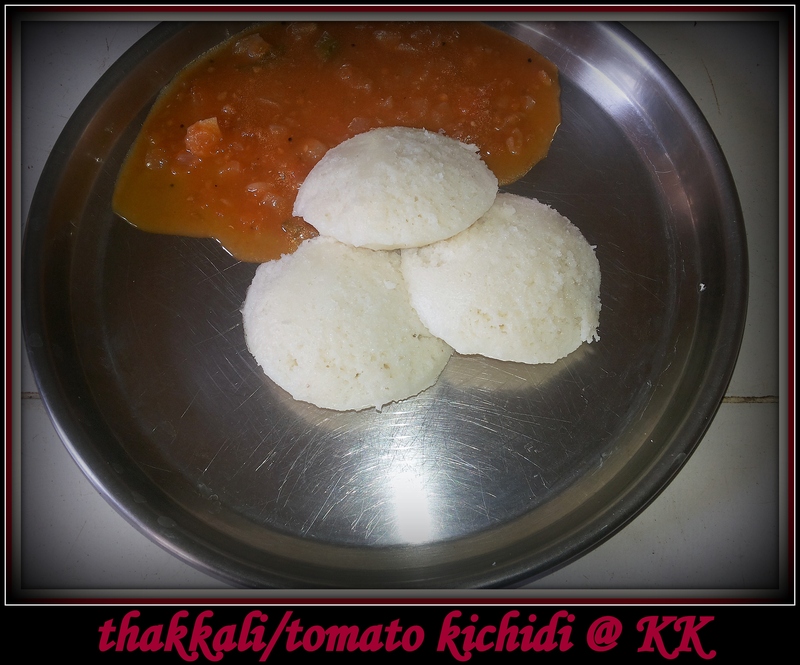 6.Insert the balls made into an idiappam maker and cook it in an idly maker. Adding water and grinding the paste smooth will help you in cooking it quick and perfect. Many skip adding coconut while grinding. But adding coconut makes it extra delicious and extra soft. 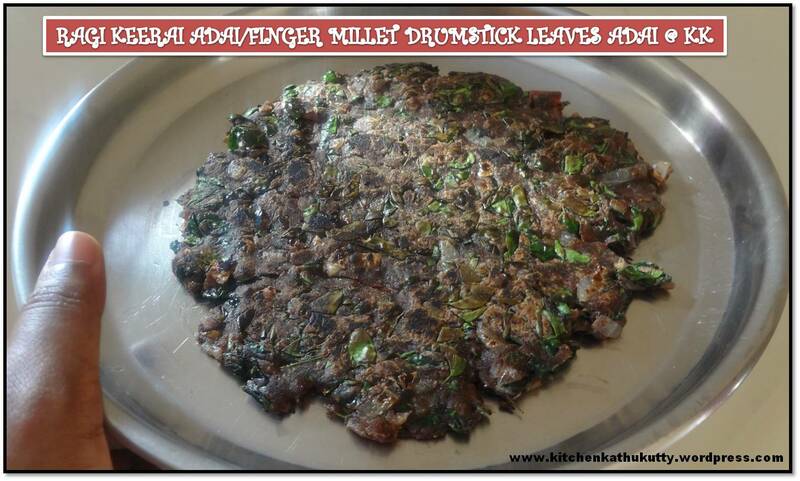 The sweet version of ragi adai which posted earlier is as below. Disslove jaggery by adding it to around 3/4 cup of boiling water. Strain it for impurities,add salt and while its warm,add it to the ragi flour and keep mixing. 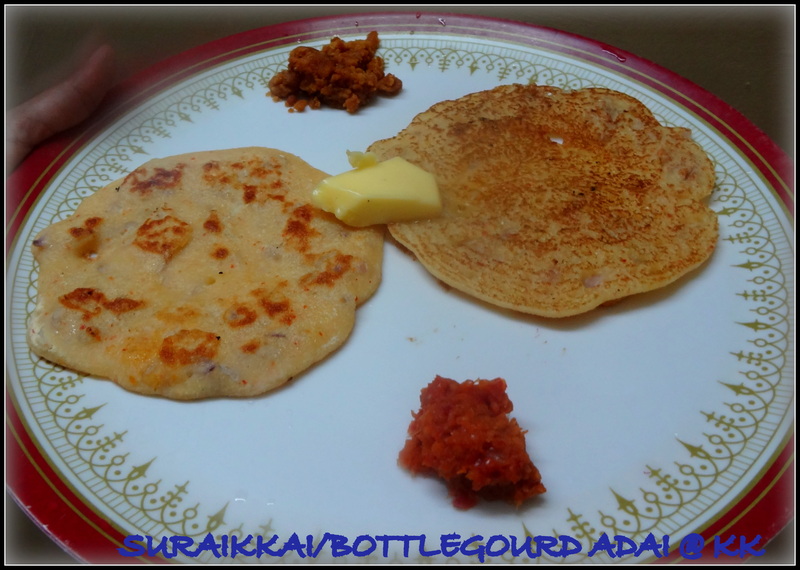 Add water if required until you attain a dough which can be even tapped into adai with hand. Make it into balls and spread it with hand on a plastic sheet greased with oil. The consistency of the dough should be like that of thatai. 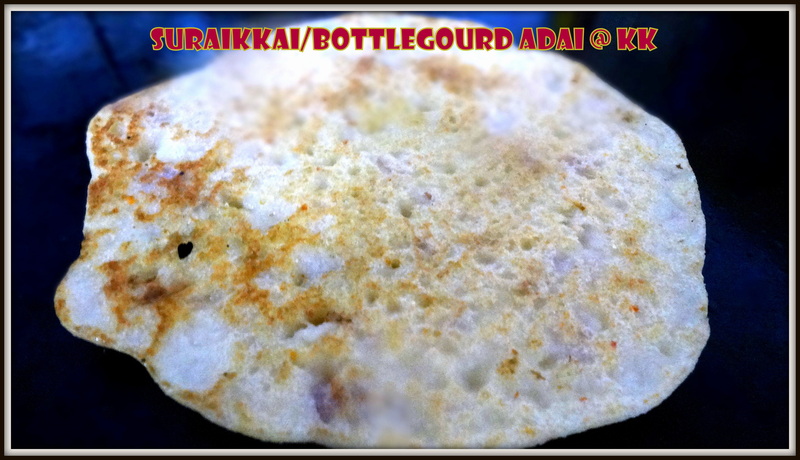 Spread into smaller adai so that it would not break. Yet another traditional recipe from grandmother. Dry roast rice separately. Roast it in slow flame until the rice begins slightly coloured. Soak the rice and dhal for 2 hours. Grind the rice,dhal,red chilly into a slightly coarse paste. The batter has to be thick.So while grinding add water accordingly. Add chopped onion and spread the batter on a greased dosa tava. Sprinkle oil immediately after spreading batter. Cook by closing it one side and then flipping the other side and cook. It goes well with onion green chilly chutney,jaggery and home made butter. This is the traditional combo which we follow at home. Roasting the rice is the most important step in this recipe. If you roast it brown the taste will change. 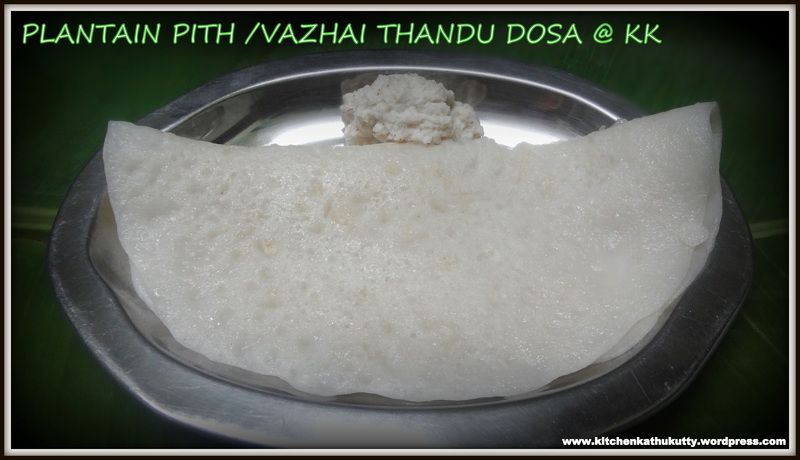 This can be made into a dosa by adding more water to batter and making it slightly thicker than dosa batter. Making the adai needs lots of patience. Make it very carefully otherwise it will break.. This is recipe which I learnt in recent days by trial and error method. I always have the habit of varying/including/excluding any of the ingredients from the original recipe and trying it out as per my wish. A very successful outcome of one such try is this. My dad and husband loved it . Wash and soak the rice and dhals together for minimum of 5 hours. Grind rice,dhals,red chilly,grated coconut,ginger with hing into a coarse paste. The batter has to be thick.So add water accordingly. Add salt and set it aside for half an hour. 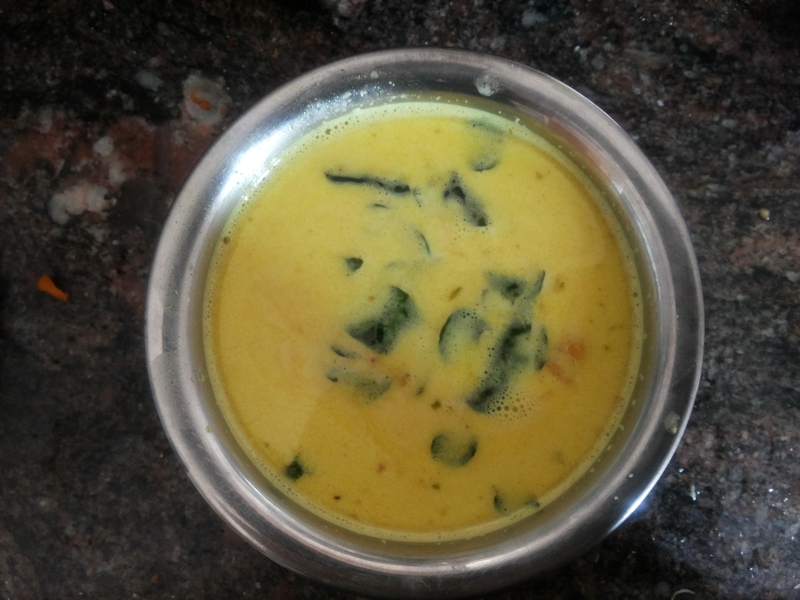 Before making dosa,mix onion,coriander and curry leaves and mix the batter well. Grease a dosa pan with oil and spread the batter to make adai. If you wish to have a lighter dosa type adai, add idly rice:raw rice in the ratio of 1:1 and grind the batter slightly in pouring form. (Slightly thicker than dosa batter). You can also skip adding coconut if you wish have the batter for usage beyond 2 hours. Coconut chutney is the best combination. But garlic chutney would be good from health point of view. Cook by closing one side with a lid and then turning it second side,if you make thick adai. This recipe was shared to me by my aunt. My aunt is an excellent cook and my uncle is an excellent critic. Mix sooji in curd and set in aside for 2 hours. Sooji would have doubled in its quantity.Now add salt,maida,rice flour and mix it well with water to reach a pouring batter. Set it aside for few mins and add all chopped ingredients along with cashew. 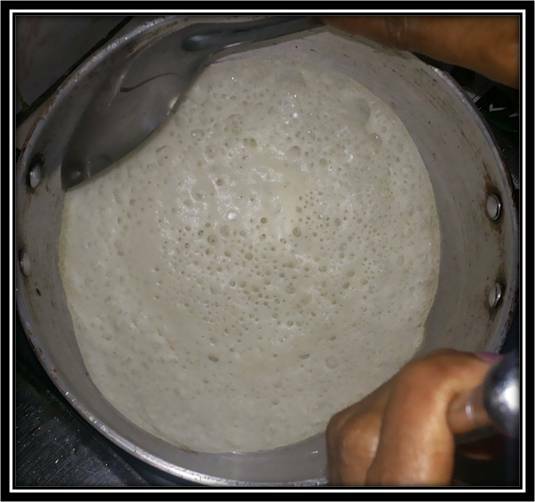 Grease a tava and spread the batter evenly to make dosa. The ratio of sooji:rice flour:maida is 3:2:1. The ratio of sooji:curd is 1:2. The curd should be slightly sour. 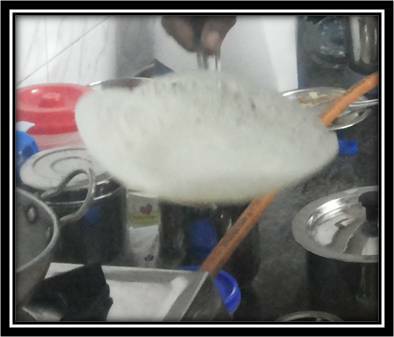 Addition of water has to be done carefully because the dosa will break while turning if excess water is added. Coconut chutney will be a great combo to this.